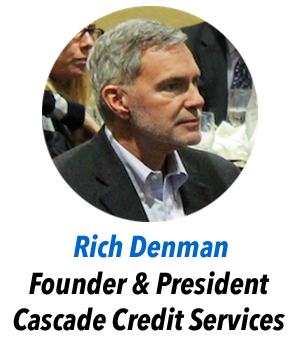 In 2018, RMA Portland offered its Skill Builders “Collateral Managed – An Overview of A/R and inventory lending”, with Rich Denman of Cascade Credit Services presenting. It “sold out”. “ABL-II – the Sequel” took place on March 13, 2019, – an exciting dive into the deeper waters of asset-based lending focusing on receivables and inventory, in some more detail compared to the first Skill Builders. Good for Analysts who review and service borrowing base clients, Relationship Managers, and Credit Admin or Approval Officers. This Skill Builders Series workshop was taught by Rich Denman from Cascade Credit Services, Inc. Cascade provides collateral examination services covering receivable and inventory loans made across the United States. Since 1995, Cascade has developed expertise that reflects the specific needs of lenders by serving Cascade’s lender clients in a variety of industries. A collateral examination (or field examination) is an analysis and written evaluation of a borrower’s collateral, focused primarily on accounts receivable and inventory.